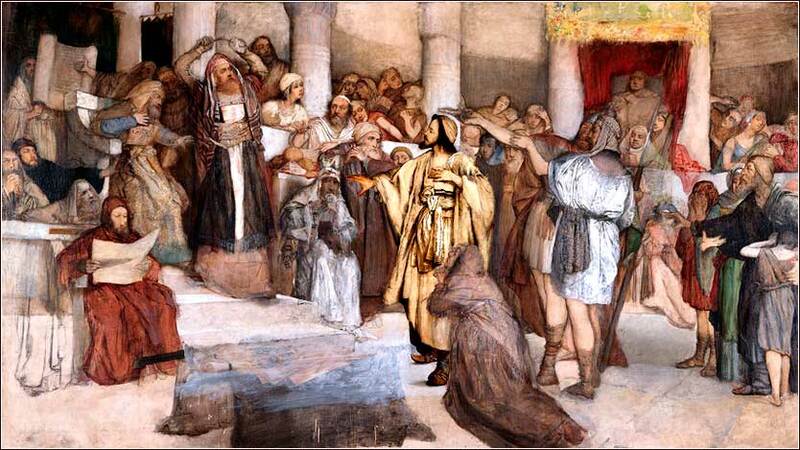 Christ Before His Judges by Maurycy Gottlieb, ca. 1878. Lyrics to "It Is No Secret (What God Can Do)"
Lord Jesus, you call me to live every aspect of my life in your presence, and so I come before you as I am. With the myrrh that the wise men carried I bring, too, the pain and sorrow and suffering that I have experienced. I lay them before you because they are all part of who I am. I ask that good may come from whatever negative things happen to me, knowing that nothing can ever separate me from your love. Charity, St. John's Episcopal Church, Somerville, NJ. 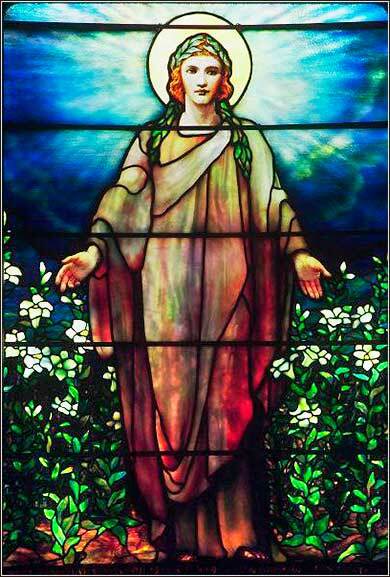 The piece was created in the Tiffany Studios ca. 1900. Christ's teachings are original. He is not interpreting the Word of God; He is delivering the Word of God. He is God speaking directly to normal men and women. Christ's revelation of his divinity to the people was gradual, accomplished in stages. Few of those present — and none of the apostles — were with Him at His baptism; so the reader is ahead of those who lived through it, in terms of information about Him. The Sermon on the Mount has four main sections: The Beatitudes (Ch. 5); Reinterpretation of the Law (Ch. 5); Relationship with God (Ch. 6); and Implementation of the New Covenant (Ch. 7). Jesus starts His great teaching with a bang. The Beatitudes turn both Judaism and common sense upside-down. Christ demolishes the lessons of both experience from living, and the earthly rewards promised by Judaism. It is, He declares, the meek, the poor, the humble and the peaceful who will emerge triumphant. But Judaism had encouraged the Hebrews to expect earthly rewards to those who followed the Law; so the Beatitudes announce that something has changed radically. But what? Has the Law of Moses been repealed? In the second part of Chapter 5, Reinterpreting the Law of Moses, Christ tells us that the law is still 100% in effect. If anyone tries to tell you that there are different categories of Mosaic law and some were abolished by Christ, tell them to read Matthew 5:18. He actually extends the Law, showing that it is much broader than Moses announced. No more will it be simply a set of rules for external conduct, but rather, it will now be extended into the innermost part of the human mind and heart. The law cannot be performed; it must be lived in thought as well as deed. He bolsters this by His Salt of the Earth analogy. To illustrate, he gives examples: Murder, an external act, is replaced by anger, an internal emotion. Divorce, Oaths, Not Resisting Evil (Eye for an Eye), and Loving Your Enemies are all specific examples of this internalization of godliness, extending the Law of Moses from our behavior to our hearts. In Chapter 6, Christ transitions into the related concept, our relationship with God. Our relationship with God, like the law, will be internalized. The emphasis on public display must evolve into a personal, intimate relationship. We will fast and pray, not so that others can see us, but as direct and private tributes directly to God, and concern ourselves with salvation, not our earthly lives. The primary teachings are Giving in Secret, Praying in Secret (the Lord's Prayer), Fasting in Secret, Laying up Treasure in Heaven, and Do not Worry About Your Earthly Life (Lilies of the Field). Chapter 7 assumes we have heard (or read), digested, and accepted the fundamentals of the new covenant set out in 5 and 6; it teaches us how to implement our new faith. We are to seek God for our own salvation; God will hear us and fulfill our requests. But although we can spread the Gospel, implementation is a personal matter; we are forbidden to judge others, a job reserved for Christ Himself; there will be no Sanhedrin of high priests to reward and punish us, and we cannot arrogate judgment to ourselves. The second part of the chapter is a sort of pep talk, telling us not to believe anyone who preaches contrary doctrine and to be strong in faith. The main individual teachings of Chapter 7 are Judge Not Lest You Be Judged, Ask and It Will Be Given, The Narrow Gate, True and False Prophets, True and False Disciples, and Build Your House on the Rock.